As 2019 marks the 300th anniversary of the death of St John Baptist De La Salle, the founder of the Institute of the Brothers of the Christian Schools and patron saint of teachers, Bro. Robert Schieler, superior general of the institute, and his council asked for and received permission from the Pope to establish a jubilee year dedicated to the saint. 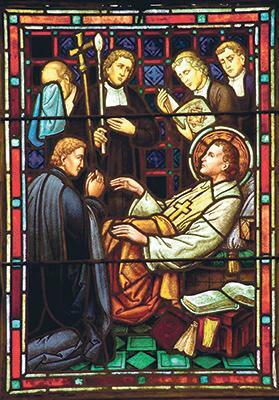 St John Baptist De La Salle on his death bed on a stained glass window at St Mary’s College, California. St John Baptist De La Salle died on April 7, 1719, in Rouen, Normandy, France. He was loved by the people for his special attention to the human and Christian formation of children and for the foundation of the Congregation of the Brothers of the Christian Schools. His life was consumed with training his first Brothers to be ministers of God in educating the poor and working class abandoned on the streets of France. For these works, he had to undergo many trials. On February 19, 1888, Pope Leo XIII declared him blessed, and on May 24, 1900, he inscribed him in the catalogue of the saints. On May 15, 1950, Pope Pius XII declared him patron saint of all educators of young people. The Lasallian Jubilee Year, which is themed ‘One Heart, One Commitment, One Life’, began on November 17, 2018, the anniversary of the dedication of the sanctuary of St John Baptist De La Salle in the Generalate in Rome. It will end on December 31, 2019. Today, after 300 years of following the footsteps of John Baptist De La Salle, the De La Salle family is made up of about 4,000 Brothers, who, together with 92,000 teachers, educators and numerous lay collaborators, teach – in about 1,200 educational centres in 80 countries around the world – 1,380,000 pupils, students, young people and adults. The De La Salle Brothers have been present in Malta since 1903, and still serve Maltese society, mainly through the two colleges they administer, namely De La Salle College in Vittoriosa and Stella Maris College in Gżira, and the La Salle retreat centre in Mellieħa. The Brothers are renowned for their particular charisma which cannot be compared to others. They are committed to spreading the Gospel and culture among young people. Due to lack of vocations, especially in the European region, it is hoped that this Lasallian spirit will live on through lay teachers who became associated within this mission, sharing the same zeal and the same sense of vocation inspired by the charisma of St John Baptist De La Salle. As we celebrate this 300th anniversary, may we honour our holy founder by emulating his love of prayer and meditation, and consciously place ourselves in God’s presence so as to know His will for our mission of human and Christian education. May our own contemplation of God’s saving presence and of Jesus’ project fill us with inventive audacity so that we can respond – today and in the future – to the educational needs of marginalised, vulnerable and neglected children and young people.